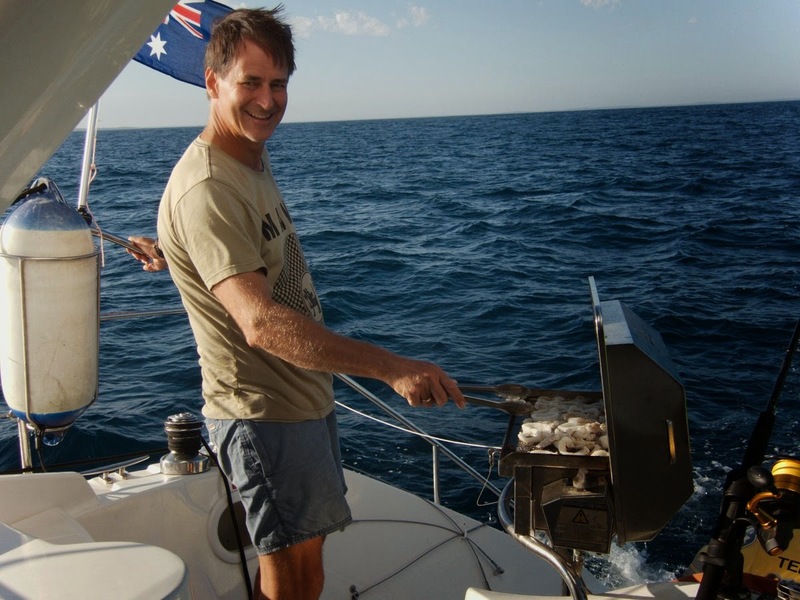 Preface: Read my Cruising Guide to SA to learn more about Kangaroo Island sailing. 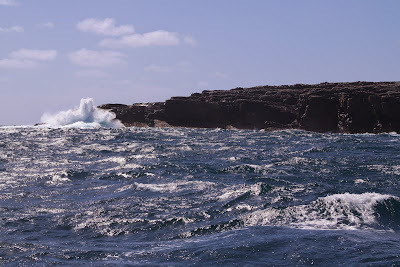 Southern Ocean south of Point Ellen. 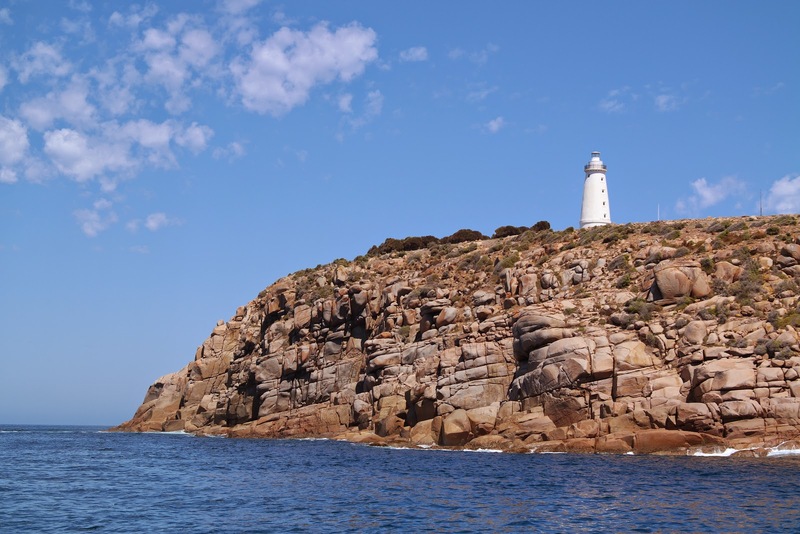 "It is highly unlikely that the average yachtsman would every seriously contemplate this epic trip, but for the adventurous, in good weather conditions, the rugged coastal scenery will present the crew with views of unsurpassed rugged grandeur that cannot be witnessed in any other part of South Australia." Scarce does however go on to describe a number of possible anchorages but points out that one must be prepared to sail non-stop for 120 miles in unfavorable conditions. 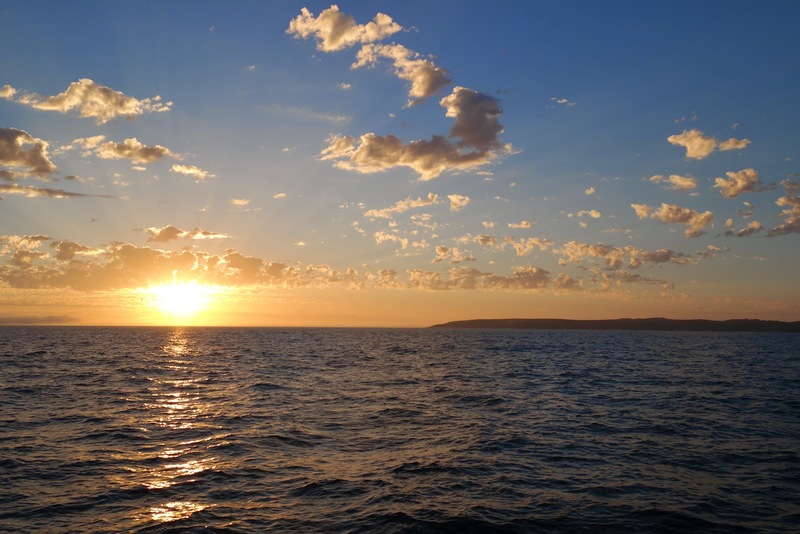 Epic or not, on Sat 21 February 2015 Arriba set out from North Haven (Adelaide) at 12:33 with four crew to undertake a circumnavigation of Kangaroo Island. It was later than ideal but we had only just sailed back from Port Vincent that morning in order to pick up additional crew, Andrew and Liam, joining us from Sydney. Gulf St Vincent was a mill pond most of the day so Arriba was not fully under sail power until evening. Sunset over calm Gulf St Vincent. 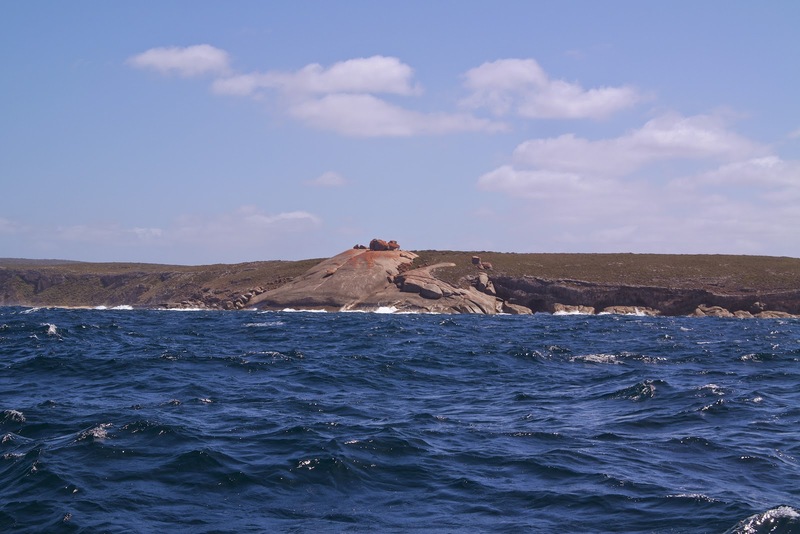 At 01:00 we anchored at Antechamber Bay (35°47.3'S 138°4.4'E) on the NE coast of Kangaroo Island. This would set us up for a clockwise circumnavigation of the Island. Initially I'd contemplated going the other way round, but it would have required a much longer sail through the night and, at any rate, the wind was not particularly favorable. Antechamber Bay is a stunning bay. 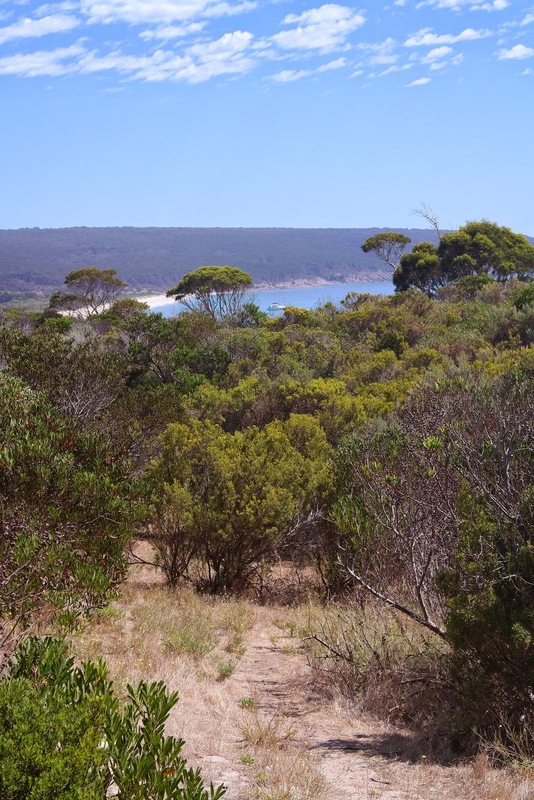 It is also home to Chapman River Wines, an easy 900m walk from the beach. Since the wind had not yet kicked in, we decided to stay for the cellar door to open at 11am. It was worth the wait as all of their wines were delicious. We all bought a mixed dozen - with free shipping anywhere in Australia - plus a few more for the boat cellar. 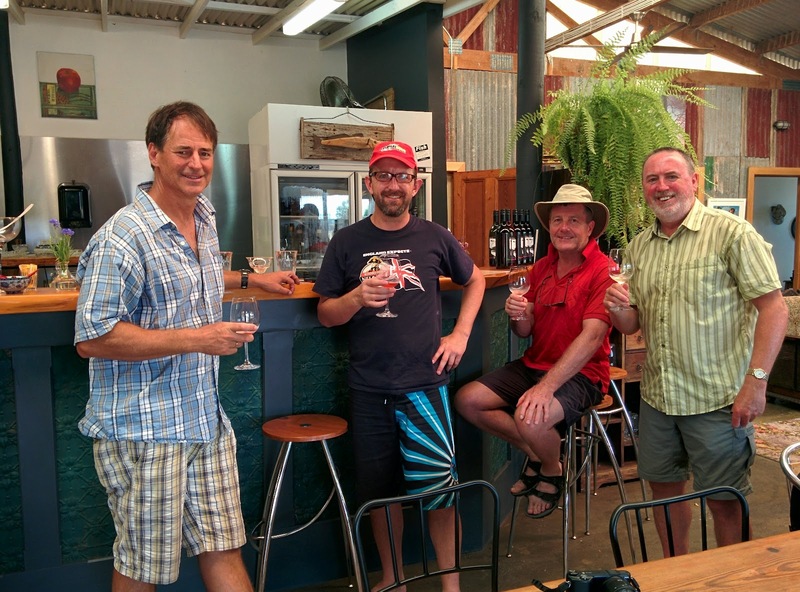 Tasting Chapman River Wines, from L to R: Alan, Byron, Liam and Andrew. The trail back to the beach. Arriba is in the distance. We weighed anchor shortly after noon, bound for Vivonne Bay on the South Coast. 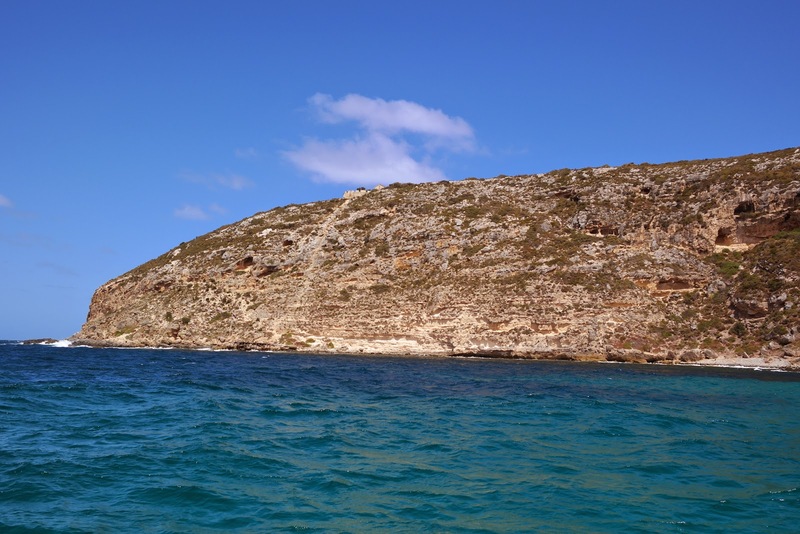 NB: Stay close to shore after rounding Cape St Albans since The Scrapers reef (35°48.427'S 138°8.220'E) awaits the unsuspecting only 1 mile offshore. 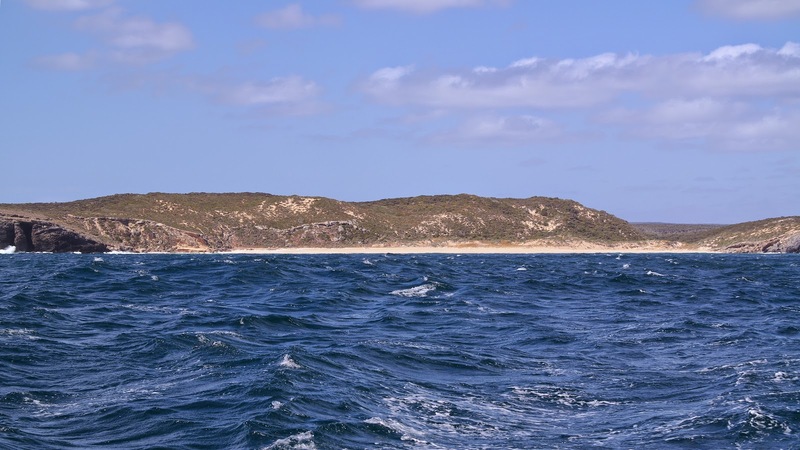 Between Cape St Albans and Cape Willoughby we passed Pink Bay (35°50.0’S 138°7.45’E). This tiny bay is the only anchorage on the east coast of KI and would offer shelter from westerly winds from S through NW. Once past Cape Willoughby we were officially off the South Coast and in the mighty Southern Ocean. 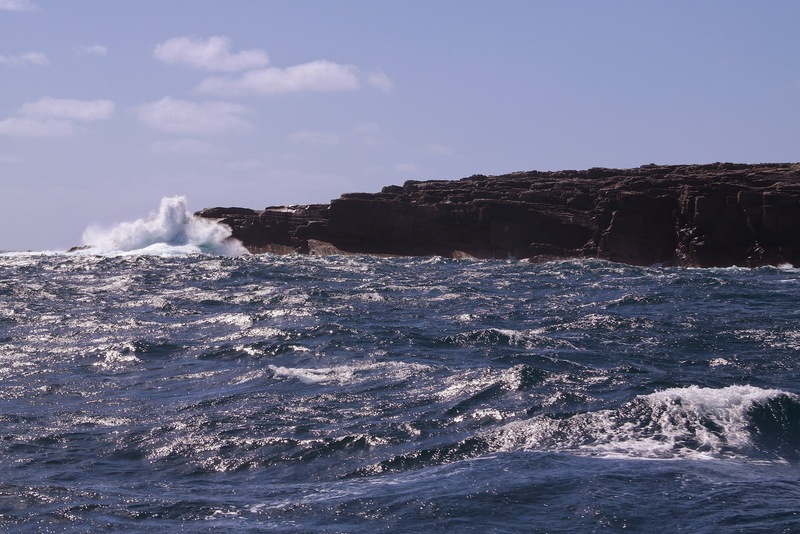 Conditions were benign however with small swells and light winds. Sea cave near Cape Hart. Five miles SW of Cape Willoughby we passed Cape Hart, whereby we set a waypoint for south of Cape Gantheaume (36°5.3'S 137°27.3'E) and let the autopilot steer. 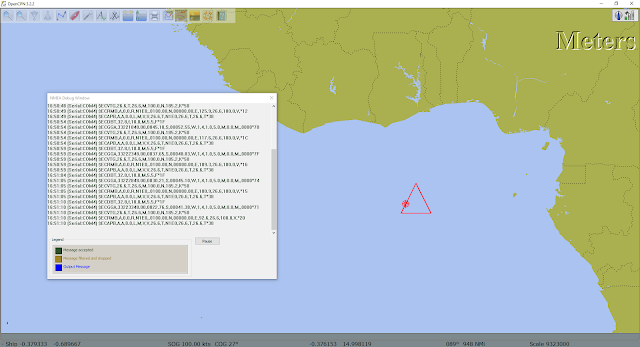 This heading would take us well inshore of the Pelorus Islets (36°6.68’S 137°31.75’E). 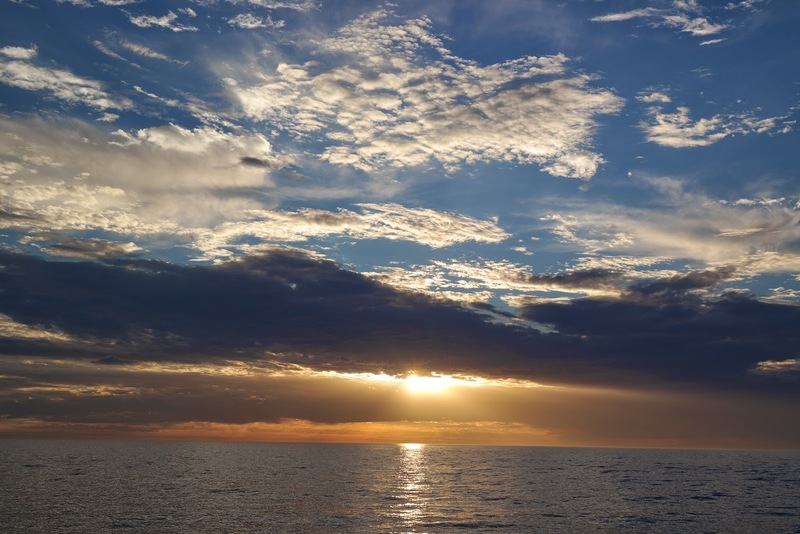 Southern Ocean sunset, approaching Cape Gantheaume. 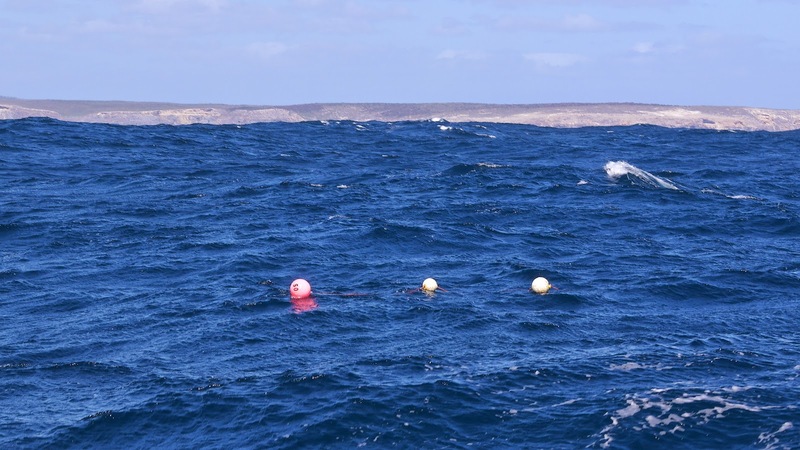 South Coast waters are plentiful with southern bluefin tuna, so we were always trolling two tuna lures, the first a skirt lure to attract fish near the surface, and the other a diving lure for those deeper down. Mid morning we noticed the skirt lure had been bitten off completely by something big. Later in the day we got a strike on the other lure, but unfortunately our prey managed to get away after fighting hard for a few minutes. Despite the lack of tuna, for our second night in row we ate dinner at sea, starting with the squid we'd caught at Antechamber Bay. Salt and pepper squid at sea. After rounding Cape Gantheaume at 20:15 we adjusted our course for Vivonne Bay. 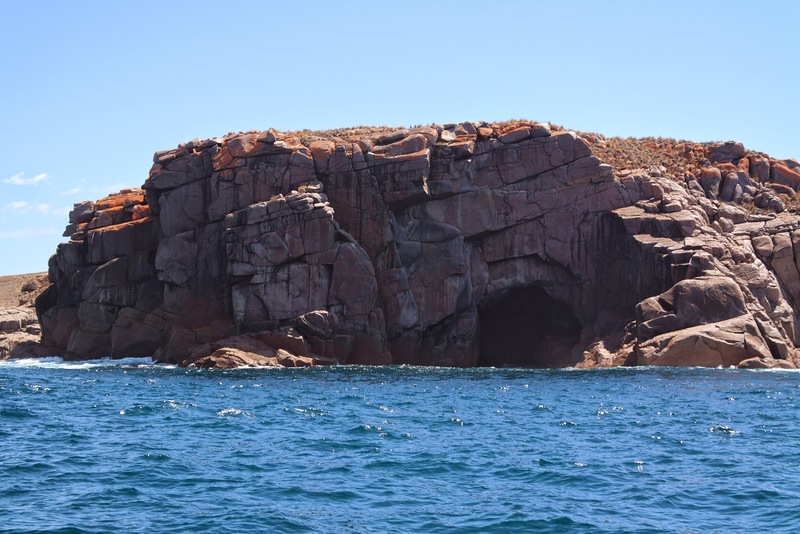 NB: Although Quin Rock is shown on charts at 36°5.812’S 137°24.509’E, 3 miles WSW of Cape Gantheaume, KI locals report that the rock is actually closer to shore. 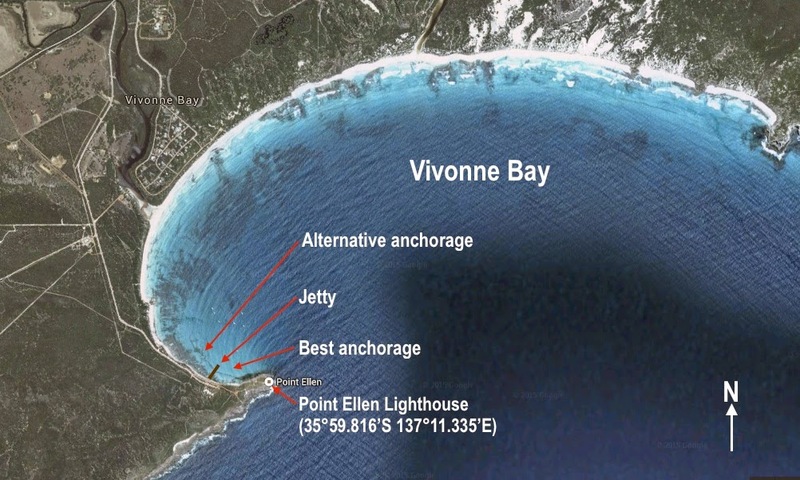 I've not be able to confirm this but set your course for Vivonne Bay immediately after rounding the cape and you'll safely pass inside as we did. The 15- to 20-knot wind was now on Arriba's beam, which made for an exhilarating night ride. The only sailing hazard were the lobster pot buoys, so we kept a watch on the bow to spot them. At 22:45 we anchored in 3.5m of water (35°59.74’S 137°11.12'E) between the jetty and Point Ellen . 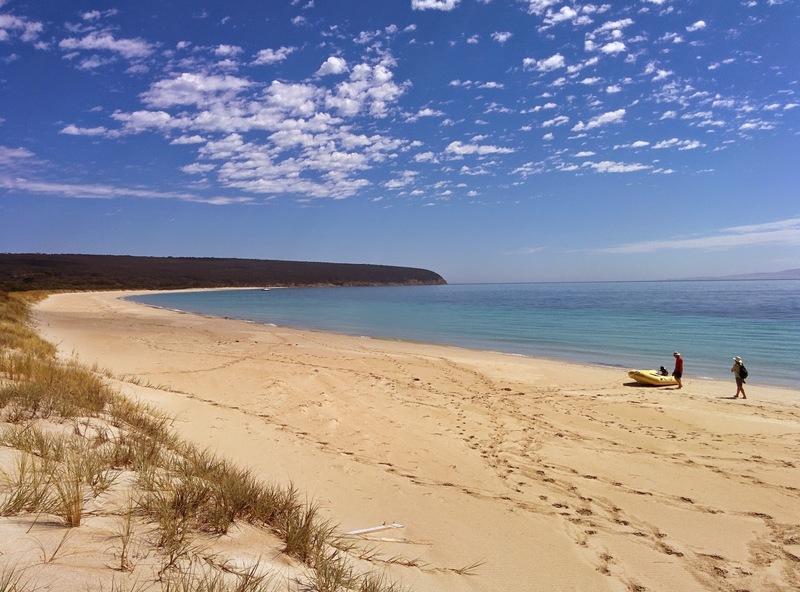 Vivonne Bay provides shelter from all directions but E or SE winds. It might even be possible to ride out a SE by tucking in very close between the jetty and Point Ellen. In our case we awoke to a 20-knot southerly but the anchorage in the lee of Point Ellen was completely flat. The windward side was another story all together. At 08:30 we weighed anchor and were met with 25-knot winds and 3m to 4m swells from the SW once we rounded Point Ellen (topmost photo). As the day progressed the sun came out and the seas, although unabated, seemed less intimidating. We set a course for Weir Cove (36°3.1’S 136°43.2’E). En route we passed about 1km south of the Remarkable Rocks (below). We turned into Weir Cove but there was too much swell to anchor safely, so we continued on our way. 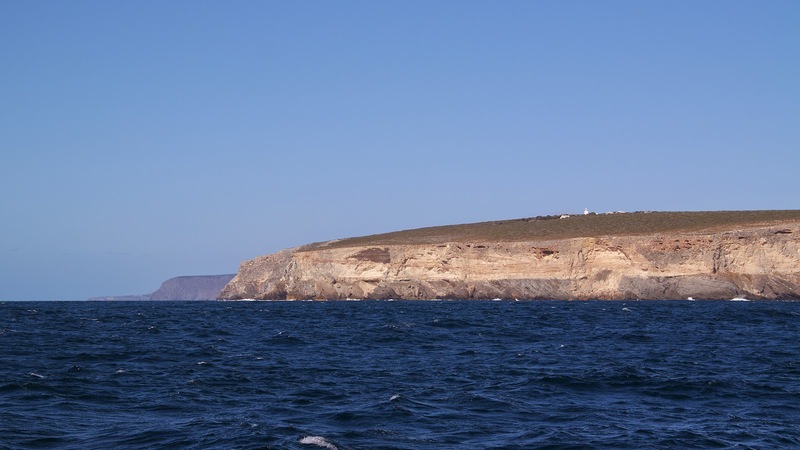 At 13:00 we had passed between the Casuarina Islets (36°4.66’S 136°42.12’E) and rounded Cape du Coedic, the SW tip of the Island. 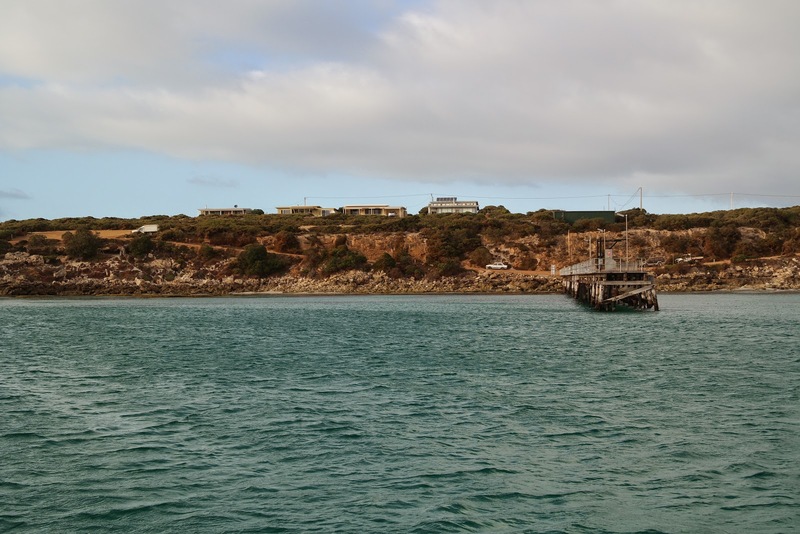 We were now on the West Coast of Kangaroo Island. 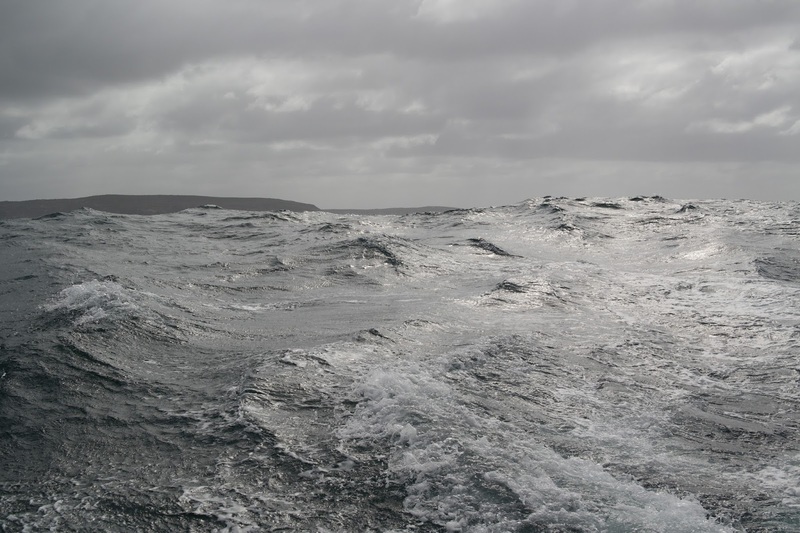 We detoured into West Bay (35°53.3’S 136°32.5’E) but again the SW swells made it too dangerous to anchor. West Bay would offer protection from the east from N through S, but is completely exposed to any swell from the west, which is the prevailing swell direction. The clipper ship "Loch Vennachar" was wrecked near here in 1905 with the loss of 26 lives. You can see from the photo just how unforgiving this coastline is. Waves smashing Vennachar Point near West Bay. Avoid these! Lobster pot buoys. 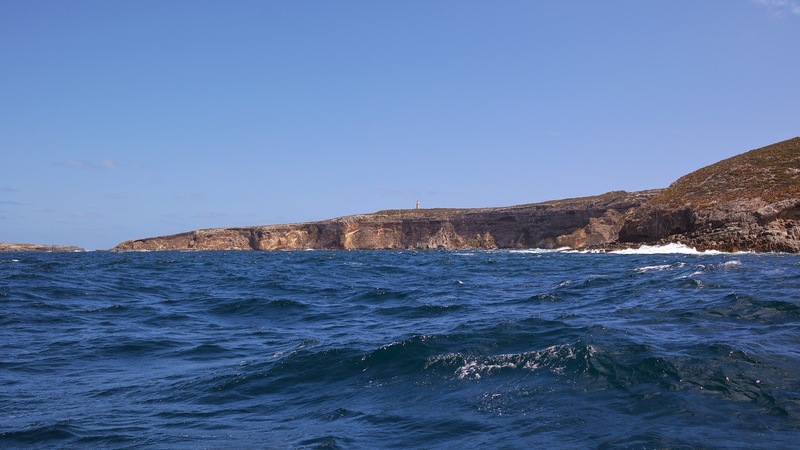 At 17:15 we were north of Cape Borda at 35°44.5'S 136°35.3'E and were now back on the North Coast. The seas immediately calmed down as the huge cliffs were now to windward. Now we just needed to find an anchorage for the evening. 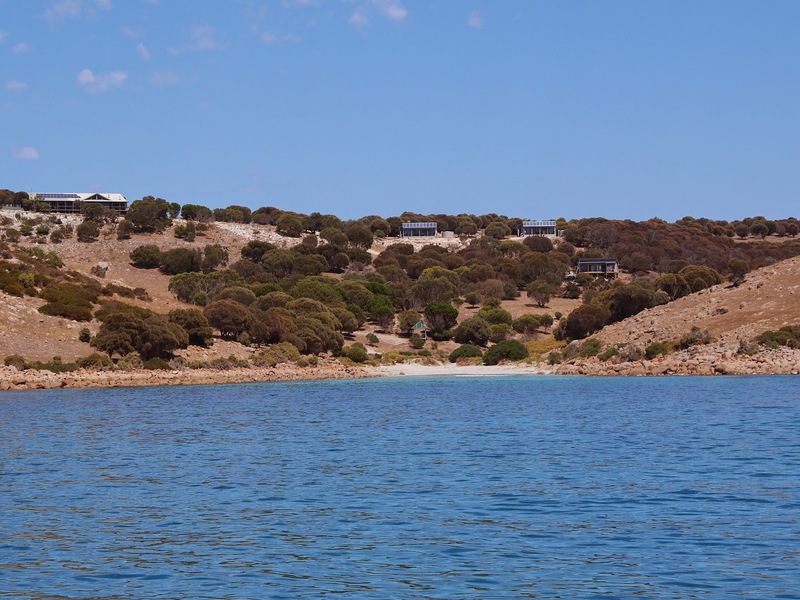 Sailing around Kangaroo Island continued here.